Clariant is committed to international compliance standards, ensuring checks and balances between the Board and Management, as well as a sustainable approach to value creation. The compensation philosophy supports Clariant’s ambition to be an employer of choice and is designed to attract, motivate, and retain committed employees. The Group is committed to Swiss and international standards of corporate governance by following the respective statutory provisions and the rules issued by the SIX Swiss Exchange, and by implementing the principles of the Swiss Code of Best Practices for Corporate Governance, revised in 2014. Clariant is headquartered in Muttenz, Switzerland, and reports in the four Business Areas: Care Chemicals, Catalysis, Natural Resources, and Plastics & Coatings, which are organized into seven Business Units. The organizational structure FIGURE 001 further comprises nine Business Services, Group Technology & Innovation (GTI), Global Business Services, Regional Service Centers, and the Corporate Center, which centralizes key corporate functions. The Executive Committee is responsible for the management of the Group. The Board of Directors is comprised of 10 members, of which three are women. 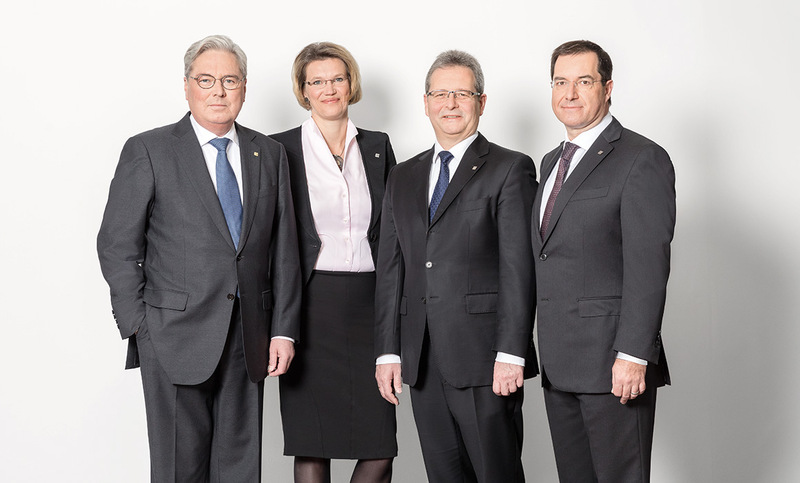 At the end of 2017, the Board of Directors of Clariant Ltd was comprised of 10 members: Günter von Au, Peter Chen, Hariolf Kottmann, Eveline Saupper, Carlo G. Soave, Peter Steiner, Claudia Suessmuth Dyckerhoff, Susanne Wamsler, Rudolf Wehrli, and Konstantin Winterstein. All of whom (except for the CEO Hariolf Kottmann) are considered to be independent in accordance with international best-practice standards. Of the three female and seven male Board of Directors members, two were 50 years or younger, and eight were over 50 years. Chairman’s & Nomination Committee: The responsibilities of this committee include making decisions on financial and other matters delegated by the Board of Directors and submitting to the Board of Directors the CEO’s proposals concerning candidates for Executive Committee positions. Compensation Committee: Responsibilities of this committee include reviewing and proposing to the Board of Directors the compensation and benefits policies and programs and determining individual executive compensation and benefits of the members of the Board of Directors and the Executive Committee, subject to the approvals of the total compensations by the Annual General Meeting. Audit Committee: The committee’s responsibilities include reviewing the company’s internal control and risk management systems, compliance with the law and internal regulations (in particular with the Code of Conduct), and reviewing and recommending the Group’s financial statements for the first three quarters of each year, and the annual financial results for the Board of Directors’ proposal for approval by the Annual General Meeting. A majority of this committee’s members must have financial and accounting experience. Technology and Innovation Committee: This committee is comprised of four members of the Board of Directors with experience in research, innovation management, and technology, and its tasks include assessing the company’s innovative activities on behalf of the Board of Directors. It also reviews measures to stimulate research and development and optimize innovative potential, as well as submits appropriate recommendations to the Board of Directors. The Board of Directors is the ultimate decision-making authority for Clariant Ltd in all matters except those decisions reserved by law or the Articles of Association for the shareholders. The Board provides the strategic direction of the Group and the company’s strategy is reviewed and further developed once a year during a two-day Board of Directors’ meeting. The Board of Directors has delegated the executive management of the Clariant Group to the CEO and the other three members of the Executive Committee. The Executive Committee is mainly responsible for implementing and monitoring the Group strategy, for the financial and operational management of the Group, and for the efficiency of the Group’s structure and organization. At the end of 2017, the Executive Committee consisted of CEO Hariolf Kottmann, CFO Patrick Jany, Britta Fuenfstueck and Christian Kohlpaintner. Of the female member and the three male members, two are in the age of 50 or younger and two over 50 years. They are appointed by the Board of Directors on the recommendation of the Chairman’s & Nomination Committee. Subject to certain limitations on voting by nominees, each registered share entitles the holder to one vote at the Annual General Meeting. Shareholders have the right to receive dividends and such other rights as are granted by the Swiss Code of Obligations. However, only shareholders entered in the Clariant share register may exercise their voting rights. Shareholders representing shares with a total par value of CHF 1 million have the right to submit written requests that an item be included on the agenda at least 45 days prior to the 24th Annual General Meeting on 1 April 2019. Based on the risk management standard of »The Institute of Risk Management«, a tool is used to prepare risk assessments each year by Business Units, Service Units, and Regions to assess threats that will impact the achievement of the objectives set for Clariant overall. A consolidated risk assessment is submitted to the Executive Committee, the Audit Committee, and the Board of Directors for review. In case of new or changed risks, reporting is accelerated. To support functional responsibility, certain functions have access to risk assessments to assist them in their roles. Examples of such functions are Environmental Safety & Health Affairs (ESHA) to identify key sites for their property risk survey program, as well as Internal Audit and Group Procurement. Competitiveness: Clariant is conducting regular benchmarking studies to ensure compensation levels are attractive and in line with market practices. Performance-Based Pay: Clariant’s Remuneration Elements aim to incentivize business and individual performance. To ensure that shareholder and management interests are aligned, performance-based short-term and long-term incentives increase in relation to total compensation as responsibility/management level increases (see Global Pay Mix FIGURE 002). While long-term and short-term incentives are based on Group Performance Indicators, individual performance – measured through a consistent, global Performance Management system – is a determining factor in career development and annual salary reviews. Within the Global Performance Management System, each manager’s or employee’s performance is assessed and discussed on a yearly basis. Since 2012, the process includes 360-degree feedback for all management levels. Short-term incentive plans (cash bonuses) include the Group Management Bonus Plan, the Group Employee Bonus Plan, and the Global Sales Incentives Plan. Success in terms of bonus payouts is generally measured against relevant Group Performance Indicators. The three pillars to balance the Group Management Bonus Plan are Group Financial Achievements, Business/Service Unit Achievements, and Top Priorities. In addition to financial indicators, the latter include, for example, consideration of sustainable inventory management, productivity, topline innovation sales, and occupational health and safety (LTAR). Long-Term Incentive plans offer equity-based compensation for approximately 250 senior managers worldwide. The Long-Term Incentive plans aim to create a strong link between sustainable and profitable business development and employee rewards. They strengthen the entrepreneurial and value-creating mindset and align management and shareholder interests. One example is the Group Senior Management Long-Term Incentive plan, which allows key managers to invest a certain percentage of their annual cash bonus in Clariant shares and receive the same amount of matching shares after three years, subject to ongoing employment. In cases where a participant has substantially contributed to a financial loss, issues resulting in restatement of financial results, reputational damage or substantial breach of legal or regulatory requirements including internal policies, the Board of Directors can decide to withdraw the allocation of matching shares.